I'm not sure I can call it progress, since the bones of the room still need so much work, but I got an email this morning that my curtain fabric shipped. I ordered a peach/grey dupioni silk from Denver Fabrics. I'm won't know for sure if I love it until it arrives, but I have a picture of what it should look like in my head. (I know, that's pretty dangerous with online fabric purchases). Oh well, it was on sale for $7.98 a yard. If it turns out to be too garish I can return it, or use it for pillows or something. I went back and forth for awhile on the idea of pink toned silk curtains, wondering if I should go with grey or blue instead. Since I picked up paint samples though, I've leaned towards grey walls, and therefore grey curtains would be too much. 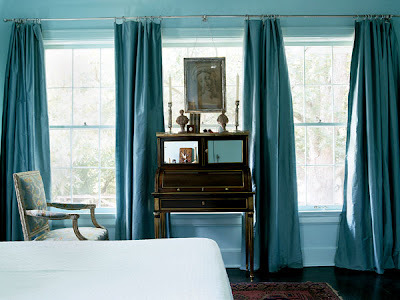 Blue curtains would also be a little too cool for the room, as its only bright for a couple of hours in the afternoon. 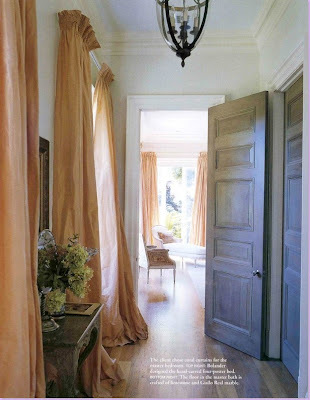 So peachy pink curtains should lend a bit of warmth and a lux factor. The overall idea is a mix of clean lined modern with a little bit of luxury. We'll see. I'm working with this plan in mind, and favoring the color scheme on the right. Making those virtual decorating boards really helped me solidify what I want. I still need to figure out the bed, but I have the rugs, curtains (soon), hanging lights, paint color chosen (a little darker than what is shown), and access to the artwork if I use my own photo (such as the grafitti image on mom's board), and a bedside table. 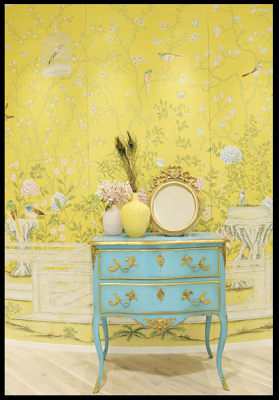 Obviously I don't have the gold leaf Eames chair, but hey-- its for inspiration. (Source unknown, has been in my inspiration file for a long time. If you know please tell me). The last is the table that I picked up at my neighbor's garage sale. 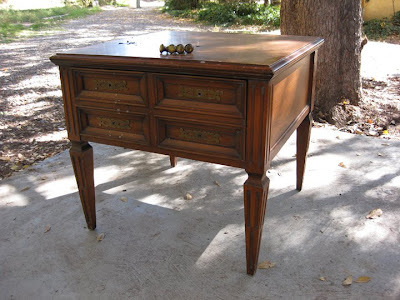 Its not quite as elegant or French as the tables above, but it is solid, has fairly elaborate brass hardware (partially removed here), tallish legs, and a drawer. All of which were desired. Painted blue and with a custom mirrored top, I think it'll do nicely. I'd still like a more modern/sculptural bedside table as well, but haven't found one that I like since the Urban Outfitters mushroom stool sold out. A couple are available via ebay, but for more than I want to pay. So, progress of a sort. 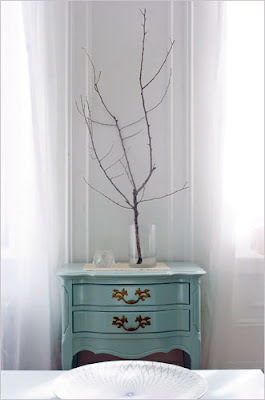 Love the idea of gray walls, really. Going to be beautiful!